Cooltrax today introduced a complete line of asset trackers – trailer and non-powered asset trackers – to provide fleet managers with quick, precise location and asset management capabilities. “Fleets are challenged to better manage assets every day. These innovative, easy-to-install trackers combine the accuracy of our telematics capabilities with a rugged hardware design to deliver real-time asset data in even the most extreme environments,” said Mike Sharpe, President, Cooltrax NA. Cooltrax today introduced a complete line of asset trackers – trailer and non-powered asset trackers – to provide fleet managers with quick, precise location and asset management capabilities. On display in the company’s National Private Truck Council (NPTC) Annual Conference booth (#1012) this week, the new Cooltrax durable, compact trailer and non-powered asset trackers allow for easy location of assets in the field, providing real-time tracking data to better manage and increase utilization of fleet assets for greater revenue potential. A global leader in cold chain fleet management solutions, Cooltrax delivers innovation and efficiencies through its suite of temperature control monitoring solutions that streamline in-house fleet management processes and reporting capabilities of trailers and perishable goods. With the Cooltrax trailer and non-powered GPS trackers, the fleet manager can instantly track or locate the asset; gain insight into asset utilization for maximum efficiency and improved billing processes; set alerts for unauthorized use and minimized asset recovery costs; protect assets by monitoring in-service mileage, usage concerns and preventative maintenance protocols; and create custom reporting metrics to improve service. Cooltrax Trailer Tracking units feature a completely weatherproof, low-profile design that installs easily to the powered asset. Delivering instant location reporting, Trailer Tracking trackers provide real-time theft or unauthorized use detection and recovery capabilities; the ability to create virtual perimeters for instant alerts of motion past user-set geo-fences and perimeter landmarks; and increased insight into engine mileage and in-service specifics. Cooltrax non-powered Asset Tracking units feature an IP67 rated, rugged weatherproof design for easy internal or external installation to the asset. 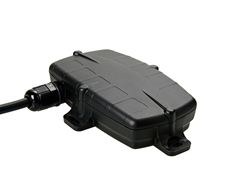 Ideal for tracking shipping containers, freight, skip bins, chassis and other applications, the Asset Tracking unit operates in even the most ultra-sensitive environments where other GPS units commonly fail like container stacks and also include an integrated accelerometer to detect movement. These high-performance tracking units provide accurate location services in an easy-to-conceal package, providing real-time data for better response times and better utilized asset deployment. These units include long-lasting, easily replaceable batteries for uninterrupted service life. For more information about the new Cooltrax asset tracking devices, please visit booth #1012 during the NPTC conference, visit http://www.cooltrax.com or call 877-667-6868. For more than 10 years, Cooltrax has helped companies across the globe operate their businesses more efficiently, with a suite of solutions that provide unparalleled visibility and control of their entire cold chain while providing warehouse and fleet managers the analytics and real-time data to manage all their cold storage locations and reefer units with confidence resulting in improved ROI. Cooltrax enables transportation, logistics, wholesale, and retail companies to become more valuable to their customers by providing visibility and actionable supply chain insights through its real-time industrial IoT platform and family of wireless environmental sensors to cover trailers, storage, in-store and at product level. For more information, visit http://www.cooltrax.com. Cooltrax today introduced a complete line of asset trackers – trailer and non-powered asset trackers – to provide fleet managers with quick, precise location and asset management capabilities.Cooltrax today introduced a complete line of asset trackers – trailer and non-powered asset trackers – to provide fleet managers with quick, precise location and asset management capabilities.